Visions of a honeymoon in Italy usually include sipping espresso at an outdoor cafe, traipsing through wineries hand in hand, and finding the best gelato. Sadly, most visitors to Italy actually find themselves sweating it out behind a selfie stick-ridden crowd trying to catch a glimpse of the Trevi Fountain. But an Italian honeymoon doesn’t have to be like that. As long as you get outta Dodge (aka Rome), you can have the relaxing honeymoon in Italy you’re looking for. Of course, you’re still looking for Italian charm and the art and architecture that Italy is famous for. And you’re going to want to eat your weight in pasta, pizza and pastries. We wouldn’t have it any other way. But you don’t have to stay in Venice or Florence to make that happen. Check out six places you can visit to enjoy a relaxing honeymoon in Italy. Starting our search for a relaxing honeymoon in Italy in the south, we have the beautiful Italian region of Sicily. Sicily, a large Mediterranean island, is located just off of the toe of Italy’s boot. Sadly, not many visitors make it this far south on their Italian honeymoon – and they are missing out. If you’re craving the crystal blue waters that crowds flock to Cinque Terre for, you’ll love the sparkling and pristine Mediterranean Sea that surrounds Sicily. But you’re not just here for the water. Sicily is also home to beautiful mountain ranges and volcanoes, scoring it even more points in the scenic book. And when you tire of Sicily’s views (not that you ever will), you can take a boat to nearby islands, like The Aeolians, Egadi and Pelagie Islands, to admire their views and untouched natural landscapes. One thing Sicily is best known for is its food. Their key ingredients include shellfish and citrus, tuna and swordfish, pistachios, almonds and ricotta. Is your mouth watering yet? In addition to beautiful views and delicious food, Sicily also has a rich culture, thanks to the many people who have called this area home. In Sicily you’ll find Arab domes, Norman castles, baroque architecture, and ancient Greek columns and temples. For a relaxing honeymoon in Sicily, we suggest: strolling through the picturesque city of Syracuse, chocolate tasting in the Baroque town of Modica, relaxing on the beach at Spiaggia di San Vito lo Capo or Spiaggia dei Conigli, taking in the views from the Ancient Theatre of Taormina, and hiking in Riserva Naturale Orientata dello Zingaro. Puglia, located in the heel of Italy’s boot, is where you should head if you’re looking to experience the best of Italy in real Italy. Here you’ll find old towns with ancient stories scattered along a stunning coastline, with delicious food and beautiful architecture to boot (pun intended!). It’s the Italy of your dreams, complete with real Italian nonnas arguing on the streets and vespas whipping by. Puglia is the perfect place for a relaxing honeymoon in Italy because life is slower here. There’s no need to rush to the next museum or gallery. You’ll find yourself leisurely strolling through picturesque alleyways with ocean views before sitting down for an espresso break that stretches all the way until lunch. If your honeymoon dreams involve wandering through cute Italian towns in the countryside, you have to visit Locorotondo. Locorotondo is located in the Valle d’Itria area of Puglia and is often heralded as one of the most beautiful villages in all of Italy. Wander the narrow streets, admire the ancient churches, climb up the hill for a view of the surrounding countryside, and sip a glass (or two!) or sparkling white wine, the beverage Locorotondo is famous for. Ostuni is Puglia’s white city, or Citta Bianca, perched on a hill. If you like exploring, this maze-like city is just waiting to be discovered. Spend your days walking the streets between white-hued buildings, including a walk around the city walls, up to the Corso Vittorio Emanuele II viewpoint, and into the stunning Ostuni Cathedral. Tuscany, home to the very popular city of Florence, is certainly no stranger to busy travellers and honeymooners. But despite its popularity, Tuscany can still make a great base for a relaxing honeymoon in Italy. After all, it isn’t just about Florence. Tuscany is the rolling green hills of Italy, home to great art, great architecture and even better wine. It’s no wonder that this region is popular. But outside of the major cities, you’ll still be able to find the peaceful Italian honeymoon you’re looking for. It’s easy to get away from the crowds in a region this vast. Tour the countryside on a vespa, visit a few of the countless number of wineries, and learn about great Italian cooking from the masters who know how to do a lot with only a few ingredients. You can even stay at an Agriturismo, an Italian farm-stay, to get a more authentic experience living and dining at an Italian countryside farmhouse. Pienza, in southern Tuscany, could be your alternative to crowded Florence. 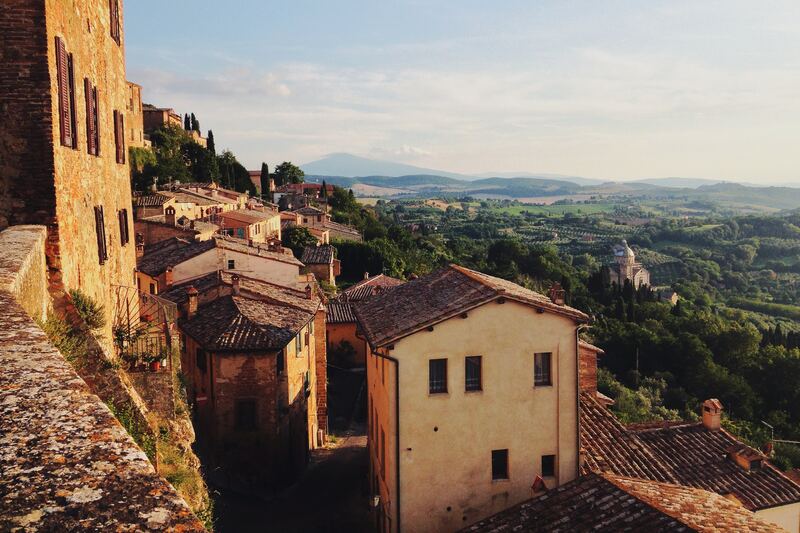 In the 1400s, Pope Pius II helped Pienza to become the beautiful Renaissance town we still see today. It’s also the first application of the Renaissance Humanist urban design, which gave Pienza UNESCO World Heritage Site status in 1996. Bonus for honeymooners: Pienza is home to Via dell’Amore (love street) and Via del Bacio (kiss street), so you know it’s going to be romantic. And if you happen to visit in September, you might catch Pienza’s annual cheese festival celebrating their pride and joy, pecorino cheese. Instead of well-known Siena, you might want to check out San Gimignano. San Gimignano is a medieval walled town, which can be seen from a distance thanks to its distinct 14 towers. Stepping through the walls of the city is like stepping back in time. And outside the city, you’ll find Italy’s most enchanting rural countryside. While San Gimignano can get a little crowded with day-trippers, you’ll have the place to yourself if you stay after hours. You could also pop in to neighboring (and incredibly cute) Certaldo for great views of San Gimignano and a romantic cooking class with Cucina Gusepina. North of Tuscany lies Bologna, the capital of the Emilia-Romagna region. This beautiful medieval city is often passed over for the likes of Florence or Venice. But we say, it’s time to give Bologna a try. Bologna is known as La Rossa, The Red, because of its terracotta tiled roofs. Its second nickname is La Dotta, The Learned, because it’s home to one of the oldest universities in the world, founded in 1088. And its third, and most exciting, nickname is La Grassa (The Fat). Bologna earned this nickname thanks to its rich and decadent food culture. This is the land of balsamic vinegar, parmesan cheese, Parma ham, mortadella and bolognese (known locally as tagliatelle al ragù). If you’re looking for a foodie honeymoon in Italy, you’ll find it in Bologna. And in fact, instead of spending time in Pisa just to catch a glimpse of the famous leaning tower, check out Bologna’s own leaning tower. Garisenda actually leans far more dramatically than that ol’ Pisa tower everyone talks about. For the perfect relaxing honeymoon in Italy, start with a food tour in Bologna sampling everything the region is famous for. Get inspired and pick up your own ingredients on the Quadrilatero or Mercato Delle Erbe. Stroll through the piazzas to admire the seven churches of Santo Stefano, the city’s many porticos, and the secret canals that Bologna was built on (it’s like underground Venice). Climb Asinelli Tower for a view and end your day the Italian way, with an aperitivo before dinner. Instead of crowded Cinque Terre, we suggest you check out charming Camogli instead. Camogli is a seaside town located on the Italian Riviera in Liguria. Like Cinque Terre and nearby Portofino, it’s home to a stunning seafront and colourful homes on a hill. But unlike those two cities, Camogli still maintains an off-the-beaten path, low key vibe. This is the place for a relaxing honeymoon in Italy. If you’re feeling active, start your days in Camogli with a hike that is sure to deliver beautiful views along the way (especially if you’re heading uphill). Next, head out on a boat to visit other towns along the Ligurian coast. When you get hungry, dig into the fresh catch of the day, the local pesto and Liguria’s essential item, focaccia bread. End your day strolling along the beach, marveling over the fact that you have this beautiful place to yourselves. North of Milan, where Italy almost meets Switzerland, you’ll find the Italian Lakes. While known, this area doesn’t host nearly as many honeymooners as you might think. But those who do venture out this way will be greeted by crystal blue waters, beautiful gardens, ancient churches and working fishing boats. The most well known of the Italian Lakes is Lake Como, thanks to George Clooney being a local resident. But if you’re not invited to hang with George, there are many other areas not to be missed. On Lake Como itself, many travellers head for the village of Bellagio. Instead, check out Varenna. Varenna is the quieter, more romantic and more beautiful version of Bellagio. It’s the perfect place to stroll along hillside houses, eat fresh farm produce, swim in Lake Como and stop to smell the flowers. If you’re ready to branch out from Lake Como, we suggest a visit to Lake Iseo and Lake Orta. Lake Iseo is the smallest of the major Italian Lakes and almost undiscovered by travellers. Rent a bike to explore Monte Isola, a car-free island in the middle of Lake Iseo, home to fishing villages and beautiful views. If you’re a wine connoisseur, you’ll also find some of Italy’s best sparkling wine produced in this region. Lake Orta has been called the Italian Lake District’s best kept secret. It’s the place to go for romantic honeymoons. Visit the medieval island of San Giulio, enjoy the architecture and take in the sweeping lake views. Everyone who visits Lake Orta leaves enchanted. The stunning Mediterranean landscape of the Amalfi Coast where mountains meet the sea is enough to attract any honeymooner headed to Italy. If you’re after turquoise waters, hillside hiking, great restaurants, and an escape from the big cities, the Amalfi Coast is for you. Unfortunately, the secret magic of the Amalfi Coast is no longer so secret. This area is well-touristed, but still leaves space for a romantic honeymoon in Italy. Instead of big names like Positano and Amalfi, head to the small fishing village of Praiano. It has the same steep cliffs and beautiful homes as other towns on the Amalfi Coast, but minus the crowds of its more well known neighbors. Praiano is the perfect place to wander through maze-like streets, enjoy freshly caught seafood, and base yourself for exploring the rest of the Amalfi Coast. Italy is like the little black dress of the honeymoon world – it’s always going to be in style. But if crowds, lines and hectic itineraries aren’t your style, you don’t have to take Italy off your list. You can still have a relaxing honeymoon in Italy, just as long as you know where to go.